In 1838, Luman Norton, owner of the Norton Pottery, moved down the hill from the Old Center of Bennington to live on Pleasant Street, to be near his factory on the Wolloomsac River. He now needed a 2 family house. He had recently been appointed a judge, and opened a second factory to manufacture firebrick (the kind used in the backs of fireplaces and in refractories). His son-in-law, Christopher Fenton, ran the pottery factory, so it made sense that the two families live side by side. However, the new house needed to be more than just a 2 family house with its multiple doors and chimneys. Norton required a residence worthy of a successful manufacturer, and a judge. 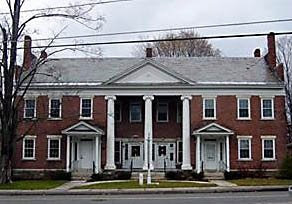 Here is what he built: a brick house with a grand, 2 story tall, porch framed by columns and a pediment (the triangle that sits above the columns), with a broad frieze board across the top, right up under the roof, bright white against the red brick . 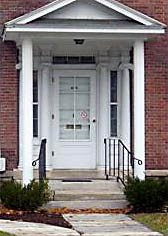 The columns he used are ‘ionic’, the style favored in the Old Center of Bennington. Ionic capitals, with those curved horns on the top, were seen as symbols for virtue and wisdom. His front doors and sidelights - now almost invisible under the little porches - repeat the details. On the ends, the brick walls step up above the roof , include the chimneys, and visually enlarge the house. These walls are structural, 3 bricks thick. They are laid in the pattern called Flemish Bond, which is one of the most difficult to lay neatly. The bricks placed on end - called ‘headers’, because when the wall is finished you see the end, or the 'head' of the brick - tie the rows of brick together. 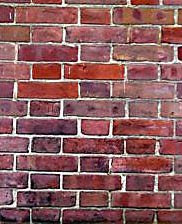 In Flemish Bond, every layer has headers. If the work isn’t done with great care, it isn’t neat. This is very neat and handsome work, because Norton could afford the best. All the parts, the 3 strong columns right there in the center of the front, the white trim, and the tall brick ends make this 2 family house into an imposing residence. Norton used the normal materials of the time - brick, wood, stone - and details well known in the Old Center -Ionic columns, pediments, friezes. His house, one of the first built below the hill by a successful Benningtonian, combined them in a way that had not been done before. Norton built in a new fashion in the new center of Bennington. Read about other Buildings of Interest: The Park McCullough House.